The Omihachiman committee would like to invite the West Michigan community to visit Shiga, Japan – Michigan’s sister state. 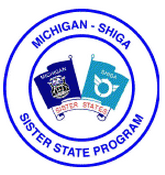 The Michigan-Shiga Sister State Board is currently seeking interested individuals to travel as delegates in the 2013 Goodwill Mission to Shiga, Japan. All residents of Michigan are welcome to participate. From October 16 to October 25, 2013 a delegation of 40 Michigan community members will enjoy a ten-day goodwill mission to Shiga, including home-stay experiences with Shiga families. For more information please see the attached application form below or contact Don Bultman on our Omihachiman Japan committee.